Warmifier is a special plug-in for professional music production applications which processes audio signal in a way similar to analog tube/valve equipment. By using Warmifier you can achieve valve warming and “console” coloration effects. 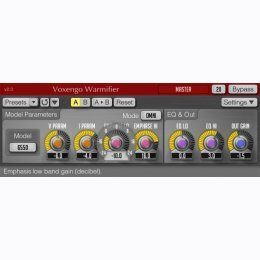 Warmifier is applicable both to the complete mixes and to the individual instrument tracks. You have several parameters at your disposal that allow you to control the strength and the color of the effect. Also, you have several tube/valve types to choose from. Each valve type offers a different overall coloration. While the effect of this plug-in is definitely subtle, the difference it makes is similar to the difference in sound between various analog mixing consoles. In most cases it boils down to adding a subtle “sparkle”, “presence”, “warming” or “solidifying” effect to a sound track it was applied to.